This installment of the distinguished RUSCH series focuses on two Peripatetic philosophers of the fourth and third centuries BCE: namely, Chamaeleon and Praxiphanes, both of whom were associated with Theophrastus, Aristotle's successor as head of the Peripatetic School. 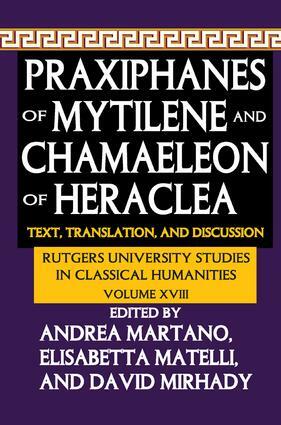 Chamaeleon and Praxiphanes were intellectuals active in the political and civic life of the Hellenistic Period. Their scholarly interests included inter alia ethics, biography, textual criticism, and linguistics. The work presents new editions of the ancient source texts for Chamaeleon and Praxiphanes. Each is accompanied by an apparatus of textual variants and a second apparatus of parallel texts. In addition, there is a facing translation in English as well as notes to the translation. There follow ten essays that clarify material presented in the text translation. The volume closes with an index listing the ancient sources that are referred to the preceding essays. This volume continues over thirty years of tradition in the RUSCH series, edited by William W. Fortenbaugh, the finest series available in Aristotelian studies.